Play N Go | A developer for people that love slots! 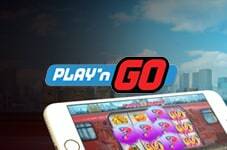 As a growing casino game software provider, Play N Go is making strides in the online gambling industry. It provides a wide variety of slots and table games for computer and mobile play. Since the 1990s, Play N Go has been designing casino games. They have never positioned themselves to compete against giants like Microgaming and NetEnt. The company has always been more focused on being the best, as opposed to the biggest. Play N Go offers table games, slots and video bingo games. In addition to standard versions of Roulette, Blackjack and Baccarat, the company is the mastermind games called Super Wheel and Money Wheel. Wheel is similar to Roulette. Players can bet on one, three or five numbers at once. For a chance at a big win, players can bet on one or the other of the wheel’s illustrated symbols. Money Wheel is also a unique game. The game is very simple, as the only goal is to correctly guess where the wheel will stop on every spin. Players can choose to predict it lands on a low number. They can choose to cheer for one of two positions on the wheel. One is a star and the other is the Joker. The endless selection of slots offered by Play N Go will please every player. Hundreds of games in many popular themes and genres make up the vast majority of the company’s slots. There are dragon themed games such as Golden Legend and Christmas games such as Holiday Seasons. Players can explore their dark side with 7 Sins or embrace their love of money with Planet Fortune. They can also test their chances of winning a progressive jackpot. Some of Play N Go’s highest paying titles include Jazz of New Orleans, Cowboy Treasure, Ring The Bell and Mr. Toad. Play N Go took the traditional Bingo game and gave it a new look. The company’s two Video Bingo games are Bug’s Party and Flying Pigs. In Bug’s Party, players get one to four bingo cards to try their luck with. Once the first 30 numbers of any game have been drawn, if a player is close to winning they are allowed to purchase as many as 10 more bingo balls. When players form a rectangular pattern on their Bingo card they get a chance at a bonus round. If they win the bonus, their winnings can increase by 150%. This unique Bingo game ends when an exterminator or a frog show up to crash the Bug’s Party. Flying Pigs follows the same pattern Bug’s Party does. Players can use the same number of Bingo cards. However, in this game they can purchase up to 12 extra bingo balls. Flying Pigs ends with a wild boar attacks the title pigs. Though Play N Go wants players to enjoy their games, they want them to do so responsibly. As a result, they offer tools that help limit gameplay. This includes a timer that lets players keep track of how long a gaming session is. It is up to individual casino operators to make sure these safety features can be accessed by players. Play N Go is not the largest provider of casino games online or offline. However, it has made quite an impact on the industry. The library of games the company produces hasn’t been lost on its players. There are countless online casinos that offer Play N Go games. When the company releases a new game, it is always unique. Every game has its own theme presented in ways other companies haven’t thought of. No matter what types of themes a player might like, they will be able to find something they enjoy. Aside from creating top quality games, Play N Go reaches out to local communities. Their involvement in fundraisers is something the company is committed to. For example, they have helped raise funds for causes such as breast cancer research. In Sweden, where Play N Go is based, athletes wear helmets branded with the company’s logo. The company is also behind the sales of bracelets, of which the proceeds are donated to charity. Many awards have been given to Play N Go in recent years. This includes honours at the International Gaming Awards. In Malta, the company was even named Games Vendor of the Year. They received the honour for titles such as House of Doom and Sweet Alchemy, two slot machine games that have become widely popular. With so many accomplishments, it is not surprising that Play N Go continues to thrive. The company has earned a reputation for producing top quality casino games that players can’t resist. Most likely, Play N Go will continue this success.